Now that we’ve had the iPad for 10 days, I can give a more thorough review than my first one. Probably the best thing I can say about it is that it has kept us up even later than usual on more than one night … and that we’ve started calling it the “CrackPad.” Downloading apps, playing games, watching videos, and surfing the ‘Net becomes more addictive on the touchscreen, hand-held device. Aside from games, some of the apps are really useful, like the excellent WeatherBug app (that auto-detects your location and gives hour-by-hour forecasts, moving radar images, and pictures from nearby cameras), talking to someone on Skype is more fun than on a computer (too bad there’s no webcam), Shazam listens to songs playing on the radio and identifies them, and NetNewsWire lets me read my blogs and RSS feeds on-the-go. And my wife will no doubt be well entertained on her next flight. On the down side, the iPad’s 24-ounce (1.5-pound) weight becomes quickly apparent when holding it–it really needs to be rested on a knee or lap, which can necessitate a hunching posture. It gets even heavier when you add a sturdy case, a necessity for something so expensive, slick, and fragile. 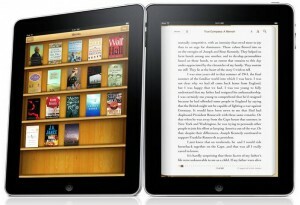 Of special interest to me is the question: How good is the iPad as an e-reader? And the answer is a pretty good one, but with some important caveats. First of all, I find it better for shorter reading (under an hour), as the backlit LCD screen is simply not as easy on the eyes as e-Ink displays or actual paper. And the weight is quite noticeable when reading, especially compared to my Kindle 2. However, color covers look gorgeous, and the iBook reading app is very well done. The iBook app mimics the look and feel of a book, especially when turned sideways to display 2 pages at once. It is simple to purchase books, arrange them on your bookshelf, open them, change font sizes, look words up in the dictionary, and turn pages. One note: while the cool-looking page turns (you swipe your finger and the slightly see-through page will follow the movement of your finger) are fun to play with at first, I very quickly desired the Kindle’s one-handed button press for page turns, which I’m glad to say you can do by tapping your thumb in the iBook app. It’s funny: people talk about e-readers mimicking books, but I already find turning pages too “cumbersome” now that I’m used to one-handed operation! As for where to buy books: while the iBook Store is not as well-organized as Amazon’s, and doesn’t have as many titles (30,000 to almost 500,000), this ironically becomes an iPad advantage because you can use the iBook store and/or read Amazon books through Amazon’s Kindle for iPad app, which is also excellent. The iPad’s backlit LCD is like a computer monitor, not as easy on the eyes for long reading as the K2’s e-Ink or paper. Reading is very simple and intuitive–I’d rate this one as a tie with the K2, both are excellent. Weight (24 ounces) makes the Kindle (only 10 ounces) feel like a feather. The iPad’s $499 starting price is almost double the K2 ($259). The K2’s 2-week battery life is in another league than the iPad’s 10-12 hours. The iPad’s color screen makes covers and your “bookshelf” look great. Although I’ve become used to the Kindle’s “locations,” the iPad’s page count (and # of pages left in a chapter) is more intuitive. The current Wi-Fi iPads lack the K2’s free 3G wireless coverage. The forthcoming 3G iPad will cost at least $629 + $30 per month. The iPad starts with 16 GB of storage, while the K2 only has 2 GB. But both are plenty for thousands of books (the iPad will undoubtedly get filled with other stuff). You can attach the K2 to your computer via USB and drag-and-drop e-books into it. The iPad requires fussing with iTunes, which is a huge hassle when trying to connect to computers other than your own. Being able to purchase books from Amazon or the iBook Store may give you more options; however, most books should be the same price in either place. In summary, it all comes down to what you’re looking for, and how serious a “reader” you are. It’s clear to me that the Kindle 2 is a superior e-reader. It’s much lighter, the e-Ink display is better for long reading sessions, it costs a fraction of the price, and the battery lasts forever. But the iPad makes a fine device to do a little light reading with from time to time. And, of course, the iPad plays games and movies and all sorts of legitimately cool stuff. But those cool things actually become a distraction as your “book” starts beeping and pinging at you when you get an email or Facebook update–the Kindle doesn’t do that. And, if you’re settled on the couch trying to escape into a good book, the lack of distraction can actually be a good thing. For two weeks, I’ve been reading iPad reviews thinking “But what would David think?” (seriously, I have!). You’ve essentially confirmed my previous conclusions: a backlit LCD ain’t no book, and $500 buys a nice weekend away with my wife. If you like to read, I think you’ll be very happy with a Kindle. It makes it more convenient, more enjoyable, and less expensive to read books. In a busy world, the new iPad is just so convenient in that I can read books via my kindle app and pay a credit card bill on the same device. Call family via Skype. I rarely ever need to use my lap top anylonger. Obviously, a ton of people feel as you do, since the iPad sells like crazy. It is certainly more multifunctional than a Kindle or other e-Ink e-reader. To me, I think it comes down to how often you read vs. how often you do those other things you mentioned (along with games, Internet, videos, etc.). Thanks for sharing your thoughts!